The four-year strife between separatists and army troops in Thailand's south has cost some 3,000 lives, yet is probably the world's least covered Islamic insurgency. The fatal 2006 beating of an idealistic Thai schoolteacher has, however, led to Citizen Juling, a documentary that more than makes up for lost exposure — with nearly four hours of raw video footage probing both that crime and society's knee-jerk response. "I left everything in so viewers could come to their own conclusions," says writer turned filmmaker Ing K, who collaborated with photographer Manit Sriwanichpoom and opposition politician Kraisak Choonhavan on this marathon of national self-examination. 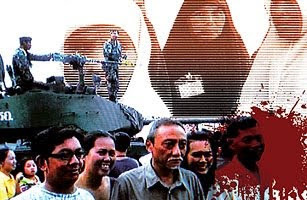 The Thai army has at times responded harshly to the insurgency and is accused of being behind numerous extrajudicial disappearances. In the Tak Bai incident of 2004, 87 detainees died while under army transport — most suffocated after being crammed into the backs of trucks. At the same time, insurgents have burned down more than 200 schools and almost 100 Thai teachers, symbols of central authority, have died. On Nov. 5, two car bombs injured over 60. The absence of any agreed-upon truth is what really drives the movie. But if one viewpoint is foremost, it is Kraisak's. After the 1991 military coup against his Prime Minister father, General Chatichai Choonhavan, Kraisak was indicted on assassination plots against rival generals and fled. Locals in the border region helped his escape, smuggling him to Malaysia. (He returned safely to Thailand two years later and denies the charges, which were never pressed.) In Citizen Juling, he returns the favor. "I had to pay back these people for their help by showing there was at least one Thai who cared about the unwarranted massacres and disappearances," he says. Citizen Juling was screened at the Bangkok International Film Festival in September but Thai TV stations have passed on it, even in serialized form — and censors may have the final say on whether it gets a general release. "It is odd that after four years and over 3,000 dead, only one Thai film has been made on the southern unrest," says Ing. "How can we have a peaceful society with real, as opposed to ceremonial, democracy without media literacy?"